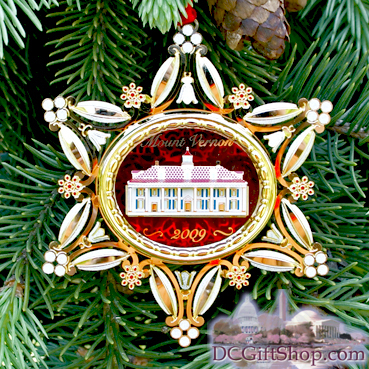 Mount Vernon's 2009 holiday ornament honors the 250th wedding anniversary of George and Martha Washington. The couple was married on January 6, 1759, the Feast of the Epiphany, at the home of the bride's parents, White House Plantation, in New Kent County, Virginia. The ceremony coincided with Twelfth Night festivities, a much observed 18th century holiday which marked the end of the Twelve Days of Christmas. In April of 1759, George Washington brought his new bride to live at Mount Vernon. Though historic events frequently carried them away, they would call the estate home for the entirety of their 40-year steadfast and devoted relationship.